Oh, Rex is gonna get soiled rotten. Photo courtesy of Karen Sellenger. I feed dog food to my dog; that does a great job of poo refill. I honestly have no idea what is in the package. 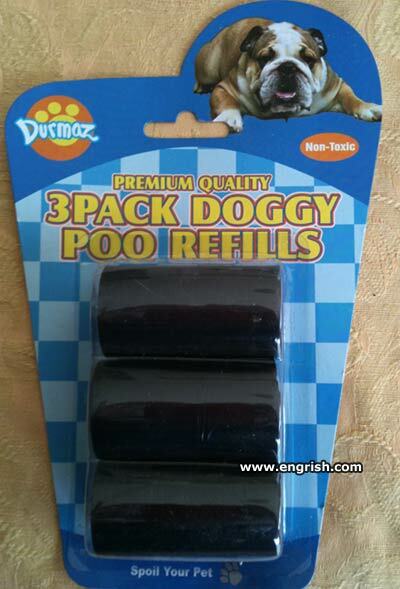 Who needs to refill their dog with poo? Sounds like one of those crazy ideas from the GOP. Excuse me while I refill my swimming poo with water. The dog on the package has already assumed the correct position for applying the refills. This is for those cases where Fido gets out of ammo too early during a long walk in the park. After drinking the six pack, I bought this 3 pack for my doggy. Mandated under the Endangered Feces Act. If the refills don’t go in easily you may need to use your ploppy drive. The kitty poo refills have been discontinued They were declared hazardous material. FYI, those are refill rolls of the little plastic bags you use to pick up your doggy’s poo. They fit in little dispensers you hook onto the leash… which you then discretely toss it yard where they never rake their leaves… it’s a mess anyway, right? – Mommy! I want another smoothie! For the canine cousin of this ovine: https://www.youtube.com/watch?v=3_NIhY_7elM. Do you know that the robots are already striking back? So they set it going and went to work. They did not observe that the dog had crapped on the floor. By the time they got home the vac had distributed the dog poo al over the house. Necessitating the replacement of all the carpets. BTW. These refills. Which end do you stick them in? Yuck . . . doggy poo refill ! If it was a snack, it would literally be a poo refill. But nah… Plastic bags.